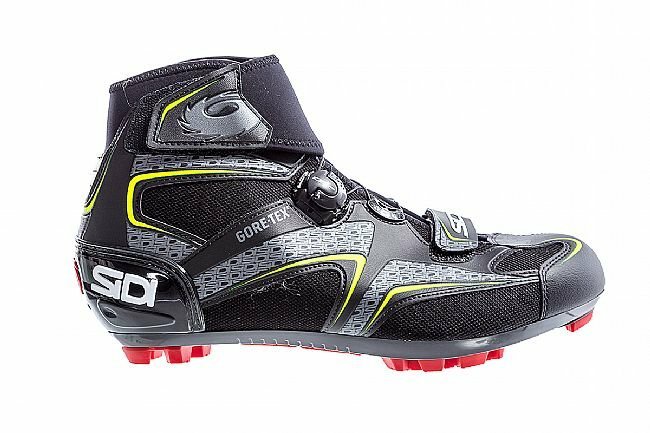 The Sidi Frost Gore Winter MTB Shoe is designed for lightweight, reliable protection from the winter elements with this ankle-height mountain bike shoe. Featuring a lightweight Microfibra Microtech upper, the Frost Gore shoe emphasizes elemental resistance, stability, and comfort without sacrificing on weight or performance. Doubling down on this, Sidi utilizes Gore's iconic Gore-Tex membrane to keep water out, yet allow steamy water vapor to escape easily. 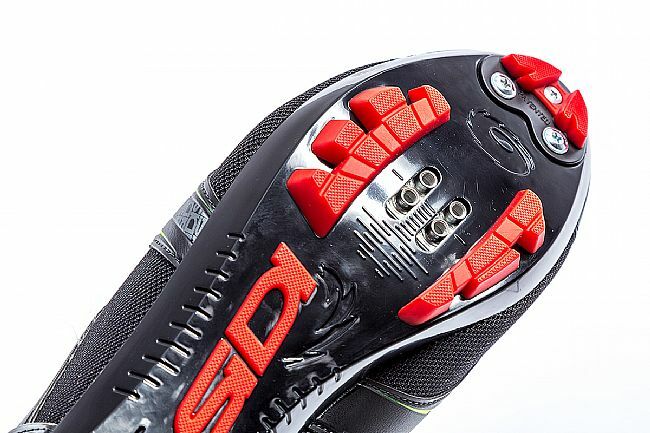 Delivering that perfect fit Sidi is known for, their Techno-3 closure offers the same reliability and adjustability that has put Sidi on the map. This fully replaceable cable-dial system allows for a non-binding, on-the-fly adjustments for getting a glove-like fit. The new RS17 sole is lighter than the previous sole and has been upgraded with a more aggressive tread pattern, a replaceable toe insert and is toe spike compatible. 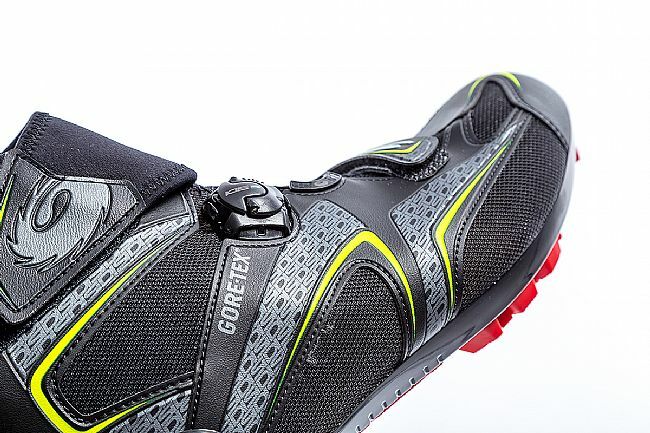 This sole offers the optimal amount of stiffness for a stable pedaling experience, and features replaceable toe inserts and compatibility with spikes. 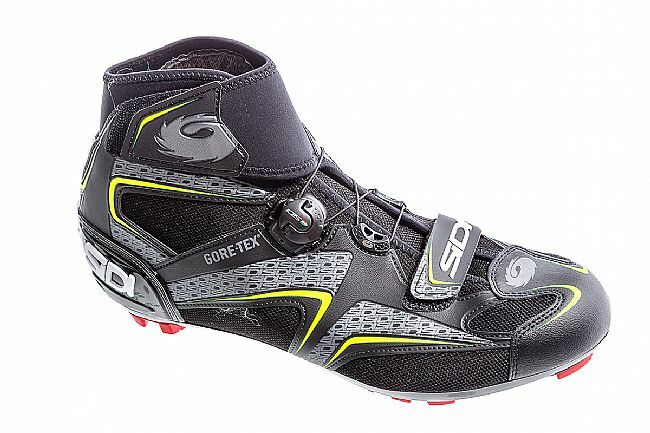 The Sidi Frost Gore Winter MTB Shoe is compatible with 2-bolt MTB-style cleats and pedals. Not available in half sizes. Claimed weight: 880 grams. Other shoes out there are better at absolute cold, great waterproofing and high quality. I've been running a set of Pearl Izumi Barrier GTX for the last 8 years or so and they have done an admirable job however, they lack proper waterproofing. These are WAY better in that regard at the cost of some lower temp handling, these aren't super insulated... The small laces dig in if going super tight as well. 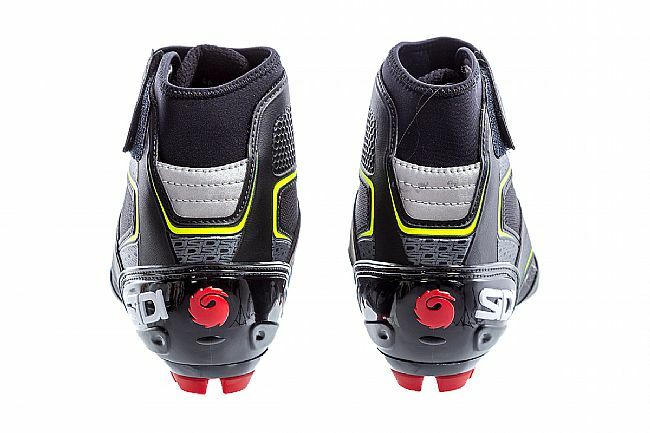 As with other SIDI products, the quality is top notch. Had to change my review after constant failure of the velcro cuff closure. The fuzzy side becomes so frayed that it's impossible for the cuff to be secured. I cut off the excess fuzz, but it just becomes frayed again. For the cost of these shoes it's unexceptable to have this kind of problem. Do not recommend. Bought these for winter riding as my older Shimano MW81 winter shoes were starting to wear out. 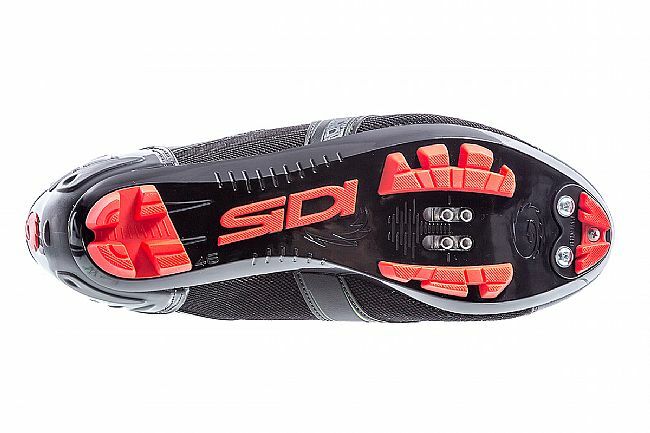 The Sidi shoes are lighter and way easier to get on and off than the Shimano shoes. So far have used them down to about 20 degrees with toe covers and no problems with staying warm. The only drawback is that the cuff does not fit as tight as I would like, and snow or rain can get into the top of the shoe. Otherwise they have the great overall Sidi quality. Warm and light, Great boot for the Minnesota Winter. Warm, comfortable & Good Looking. I have regular Sidi riding shoes and love them. When it turned cold enough that I could feel the wind coming through the vents, I realized I had to find a solution. I tried those booties that go over your shoes and they work okay, but are a complete pain to put on. And after one wearing that was mostly riding and very little walking, I had almost worn a hole in the bottom. So I paid quite a lot for these shoes - and worth every penny. They are easy to put on and take off. They are warm and very comfortable to ride with. They look great too. I wear a perfect size 10 and a half. My summer Sidis are 45s, and so are these. They fit perfectly. Use the Sidi size chart. The good, it's a racer's shoe first and foremost. Very stiff platform to put the power into the pedal. The shoe is slim and light, yet still keeps the elements out. 20 degrees is the lowest I've had to ride in, but with medium weight socks the feet remained happy. Good materials and construction throughout. And the bright green strips will make you go faster. The bad, I'm on fence giving recommendations for commuters. The shoe is waterproof, but the ankle strap leaves a gap. If your pants don't cover the top of the shoe water will get in and since it is waterproof it's not going anywhere. Gators or long pants are a must if riding in rain. Because the ankle cuff is loose walking is not a problem and the sole has a softer plastic so at least you won't sound like a shod horse when walking indoors. The ugly, the price for one, you'll need to hide the credit card statement from you know who and the fit. They said to order up a size. Makes sense if you'll be wearing a thick winter sock. But the sizing seems spot-on, so anything other than a thick sock seems too loose. It is a winter shoe though and some of you wear two pairs of socks, if you're a racer you might want to get your actual size, assuming you'll use a single middle to light-weight sock. Excellent, expensive shoes that run true to size. I have nothing but good things to say about these shoes, except the price which of course is flat out expensive. If you can get over that they are a very good choice in winter riding shoes. Why I am taking the time to write a review is to help with choice of size. I wear a 10 D US shoe size. I have never fit into a 10, and I rarely wear 11 except when the shoe only comes in whole sizes. Depending on which chart you look you look at, a 10 is either a Euro 44 or 45. 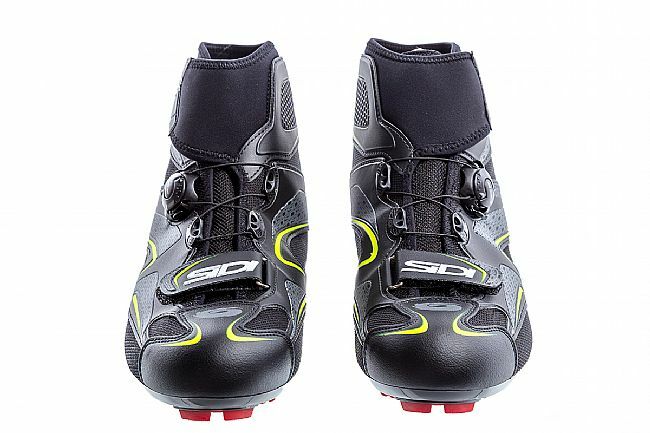 On the Sidi chart on this site, it is a 45. I have Sidi summer weight riding shoes and read advice from more than one source advising going one or two sizes higher because they run small. 45 was perfect. I love those shoes, so when I started shopping for winter shoes I went looking for Sidi, only to be advised the same thing they run small. Since I had Sidi shoes already, I decided to ignore the advice and order 45s. Perfect fit, it turns out. I can't speak for other sizes, or odd shaped feet, but if you are pretty sure of your own usual size, my advice is to order according to Sidi's size chart. I live in Minnesota and it gets cold here. I typically ride until the ground freezes and then it's time to go skiing or ride the fat bike. Until then, I'm a roadie and I detest shoe covers. They are expensive, I go through a pair or two every year since they don't tolerate even a little walking very well. And they are too hot nor do they breathe well - most of them are neoprene. When I'd take them off after riding at around 30F, my shoes would be wet with liquid water from sweating. So I needed a shoe that was good down to about 25F and up to about 45F. Above 45F, I can wear regular road shoes with those toe caps out of neoprene. Below 20F and I'm into heavyweight winter riding and that's either regular snow boots or a pair of cold weather riding boots that I have for fat biking. Anyhow, so I bought these because I'm a Sidi fan boy but with some skepticism because Sidi's previous efforts have been pretty bad. The Techno boa-like system work great. The tongue is comfortable, the shoes are wind impervious. There is a thin lining of insulation which is probably equivalent to a shoe cover, but it breathes well. The sole is pretty much what you'd find on a Dominator level shoe. It's rigid in the shank and very very slightly bendable in the toe. That's nice - if you clomp around on slippery surfaces in winter, nice to have a something that gives you a little grip. That's why I switch out the road pedals for mtb pedals for winter riding anyhow. These have been sized up from a standard Sidi shoe in this size to accommodate thicker socks. That worked ok through the forefoot, but the heel (at least mine) feels a little loose back there. It doesn't lift or move while riding but it doesn't feel as secure as I'd like it. I dug out a pair of socks that has more padding around the heel and under the ball of the foot and that made a big improvement. I'll experiment a little more with both my insoles and my socks and I'm sure I can fix that issue. Today I slapped some cleats on them and took the for a ride between 37F-40F according to my bike computer. They were warm, not too hot but comfortable, and they did a good job of letting the moisture out through the GTX membrane. I'm sure these will be good to around 20F but I don't think I'd want to push them past that. For my purposes, they meet my needs. These shoes are very comfortable and provide top protection form wet conditions and colder weather. The fastening system keeps the foot stable while pedaling. Walking in these shoes is near natural. I've worn only SIDI's for the last 30 years or so. Sold on them.This is my first winter boot. I live in Colorado and ride these in wet, muddy snow in the 20 -30 degree range and with the heavy wool socks I wear, my feet stay comfy and dry, no bootie needed. Well worth the price. Only wish it was an SRS model. I replace the treads often on my other SIDI's.